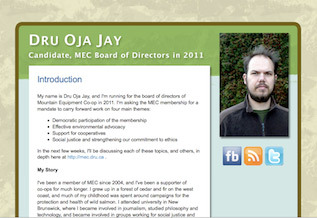 MEC has committed one percent of its annual income to environmental causes. The total amounts to close to $2 million per year. Since 1987, MEC has given environmental groups over $17 million. Such an initiative is unprecedented among organizations of MEC's size in Canada. It should be celebrated, and other businesses and co-ops should be urged to make similar commitments. Dozens of important environmental groups have received funding through this initiative. That being said, $2 million is a lot of money, and it's worth taking the time to ensure that it's being used in the most effective way possible. The centerpiece of MEC's "1% for the planet" initiative has been the Big Wild campaign, a partnership with the Canadian Parks and Wilderness Society (CPAWS). Founded in 1963, CPAWS is a national organization with chapters across Canada. The crowning achievement of the Big Wild campaign has been the protection of the South Nahanni Watershed. It is a significant area by any measure, covering over 30,000 square kilometres of picturesque mountains, rivers, and one of Canada's largest waterfalls. What could be wrong with protecting 30,000 km2? It's hard to argue with large-scale conservation, but some looming questions are not being asked often enough. CPAWS is, through the Canadian Boreal Initiative (CBI), a partner with Suncor, the fifth largest oil company in North America. 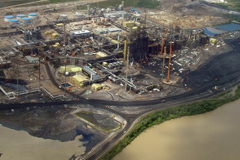 Suncor is the largest tar sands operator, and has a multi-billion dollar project underway in Libya. In the same way, CPAWS is also partnered with logging companies like Tembec, Al-Pac and Domtar, along with tar sands operator Nexen. Suncor's tar sands production was 323,000 barrels per day in January. The company's toxic tar island tailings pond is adjacent to the Athabasca River. According to a report commissioned by the company, 67 litres of toxic tailings leak into the Athabasca River every second. Meanwhile, communities downstream are experiencing an epidemic of rare cancers. In 2010, CPAWS, Greenpeace, several forestry companies and other conservation groups signed the Canadian Boreal Forest Agreement. This agreement claimed to "save the boreal forest". However, it did nothing of the sort. The agreement allows logging companies to continue cutting at the same rate as before. In exchange for adoption of "world leading practices," the signatory conservation groups agreed to help the signatory logging companies market their products. The agreement was recently criticized for failing to protect caribou habitat, which was a centrepiece of the public relations materials around the agreement. Aside from their intentional partnerships with destructive groups, CPAWS and others may have unintentionally paved the way for additional destruction in the Northwest Territories. 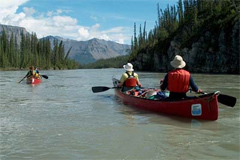 In November 2010, a year and a half after the South Nahanni watershed was protected, the federal government lifted sub-surface protection on the ecologically vital 25,000 km2 area known as Edehzhie. Some experts close to the issue have attributed this to an industry backlash from the Nahanni expansion. The question that needs to be asked is this: Is it legitimate for an environmental group to partner with a company that is destroying an ecosystem in one area, in order to protect another area? If so, what is actually being accomplished? I have a personal opinion about this. I believe that if the tar sands are allowed to expand, we are paving the way for a massive global increase in the use of dirty oil that is putting the health of our planet in peril. For me, conservation means preventing destruction. In the world of organizations like CPAWS, it is possible to rationalize a partnership with a company causing untold destruction like Suncor in order to protect a scenic area like Nahanni. 1. To conduct a thorough discussion about the destructive industries we are partnering with, in consultation with the membership, to determine whether these partnerships fulfill our conservation mandate. 2. To discuss more broadly, in consultation with the membership, what our conservation goals should be, and identify the most effective means to achieve those goals. I would push, as a result of these discussions, to set strategic guidelines for future conservation campaigns, and to set minimum standards of conduct for organizations receiving money from MEC.